Robert was initially drafted in the Army, so he enlisted in the Marine Corps. 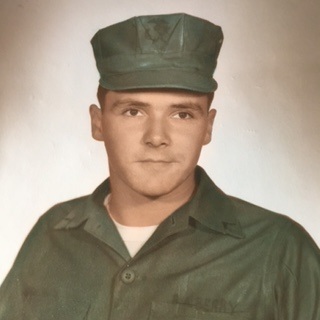 Robert aka Bob's unit in Vietnam was the 1st Battalion, 3rd Marines, Delta Company. His first letter home was 8/15/1966 from DaNang, he was 20 years old and married 3 months. Bob was a gunner on a chopper, picking up and dropping off troops and went on patrol in the jungle some times for up to 30 days. He said he was scared but put aside his fears and trusted in God. He was never angry about the war, and said it was his duty and he was good with that! All of his family was so supportive and they sent him packages often. Robert loved the Marine Corps and was very patriotic. HooRah! Semper Fi! In 1953, Robert Berry lived with his Uncle Woody and Aunt Lavonne Woodlock, at 4623 Dunrobin Avenue, Lakewood. Robert attended elementary, junior high and Lakewood High Schools and was a member of the Chi Sigma Fraternity. He graduated in 1964 and had the fondest memories of Lakewood.